28.03.2014. After a very tense and dangerous bus ride less than two miles from the hotel, only to have to walk the last 100 meters of the way on a side street, our first official visit was to the only wine bar in Tbilisi called Vino Underground Wine Bar & Shop. As its name suggests, this is an underground cellar that was converted into not only a wine bar, but also a small and delightful wine shop that brings to Tbilisi some of the best natural wines of Georgia. Owned and operated by seven small Georgian wineries, here one can find a wide variety of wines representing the different wine regions of Georgia. The vast majority of wineries of Georgia are very small. But there is a movement for some of these wineries to work together to improve wine quality and awareness. From traditional Georgian qvevri to western stainless steel styled wines, from fresh and light whites to fuller bodied and savory orange (or amber) wines, our host, John Wurderman and a few of his fellow Georgian wine makers gave us a most well rounded introduction with a very well prepared tasting of Georgian wines to be discovered during the International Wine Tourism Conference in Tbilisi this weekend. Although myself and many of my colleagues struggled with names such as Kakhuri Mtsvane, Saperavi and Tavkveri, which are the names of just a few of the five hundred indigenous grapes used for making Georgian wines. Last night’s tasting was an excellent way to start the up coming events. An azarpesha is a small metal bowl with a long handle. It is used to drink wine. In Tbilisi, Azarpesha is the name of a restaurant/wine bar. Owner, Luarsab Togonidze, dresses in traditional Georgian clothing and serves as tamada during a supra. During our visit, the International Wine Tourist Conference media group experienced a supra, a Georgian feast where a tamada makes toasts. For the evening, John Wurdeman of Pheasant’s Tears Winery in Signagi served as toastmaster. 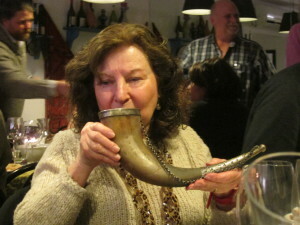 One of the toasts was made using an azarpesha. We sat at tables that already had several traditional Georgian appetizers available to eat. John explained the rules of a supra. He stressed the importance of pacing yourself when it comes to the food and wine. He also stressed that during a supra, if a tamada ever says “bottoms up” do not believe him. You do not have to drain your glass after every toast. Two Pheasant’s Tears wines, Rkatsiteli and Saperavi were at the tables. John also said that throughout the evening there would be many toasts, polyphonic singing and food. After each toast there was a polyphonic song. The three part songs were in Georgian. Even though most of the media group did not understand the words, the music touched our hearts. No one was eating during the first several songs; we were entranced by the music. The first toast was made to our Creator. Following toasts covered several themes including Anthony Swift of Wine Pleasures who organized the conference and the people at the National Wine Agency of Georgia. John explained that if a tamada alaverdied a toast, he passes the toast to another in the room. The next toast was to Georgia. John then passed the toast to Terry Sullivan, who also spoke of the first visit to Georgia when he was a guest and now he feels like family. The toast was then passed to Luarsab Togonidze who spoke of Georgia and peace. Other toasts during the evening included love, our loved ones who passed away, women, our children and the chefs and kitchen staff who worked tirelessly during the evening. Between toasts, John opened a sparkling cider that was made in Georgian qvevri in the state of Virginia. The refreshing apple cider was very palate cleansing and several of the media made positive comments about the cider. Dessert was served and chacha was opened. Some sipped their chacha while other drank their chacha like Georgians downing it in one gulp. The evening served to bring the media group together, but more importantly it gave us an example of Georgian hospitality. Memories, that will last a lifetime, were created during the three-hour supra. We all felt a warm welcome to the birthplace of wine.